The ceremony, a highlight in the Institute's annual calendar, recognises the achievements of the many staff and students who complete Mandarin classes at LSBU. As part of the programme, representatives of the Confucius Institute and their partners also award internships and scholarships to students who have demonstrated outstanding achievement in their engagement with Chinese culture and education. "China has the fastest growing economy right now and scholarships like this don't come around often. It's an amazing opportunity and I'd advise any student who is interested to get involved with the Institute's work here on campus." "I want to commend and congratulate Osman and the many staff and students whose achievements and success have helped integrate Chinese culture and language into the fabric of life at LSBU. I commend you all and wish the Confucius Institute continued success." Five students were also awarded summer study scholarships by the Confucius Institute. Congratulations to: Hashim Akram, Mehmet Tarhan, Haider Hussain, Jordan Paisley and Daniel Perkins, each of whom will study at one of the Institute's partner Universities in China. The final order of business was the awarding of certificates to ten exceptional students of Mandarin. 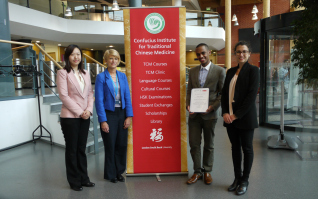 The Confucius Institute provides accredited language courses for LSBU staff and students throughout the academic year. "These initiatives - language classes, the opportunity for an educational scholarship and the internship programme - are all amazing opportunities for the LSBU community. For our students, it provides valuable work and cultural experience, and gives them an 'edge' when it comes to applying for jobs in the UK and internationally."